What is the first thing that everyone usually rushes to get on their plate first? The biscuits. 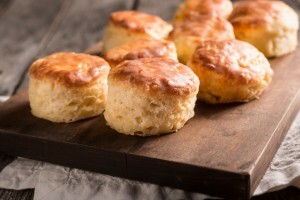 A delicious addition to any meal, these fluffy and easy biscuits will melt in your mouth! Makes 6. Heat the oven to 425 F (220 C). Whisk together the dry ingredients in a large bowl. Cut in the butter or margarine until crumbly in texture. Slowly add in the milk while stirring, until the dough reaches the right consistency. On a lightly floured surface, knead the dough for roughly 60 seconds. Shape dough to 1 inch thick roll, and cut biscuits, and place them on a baking sheet. Bake biscuits for about fifteen minutes, or until golden brown and fluffy.